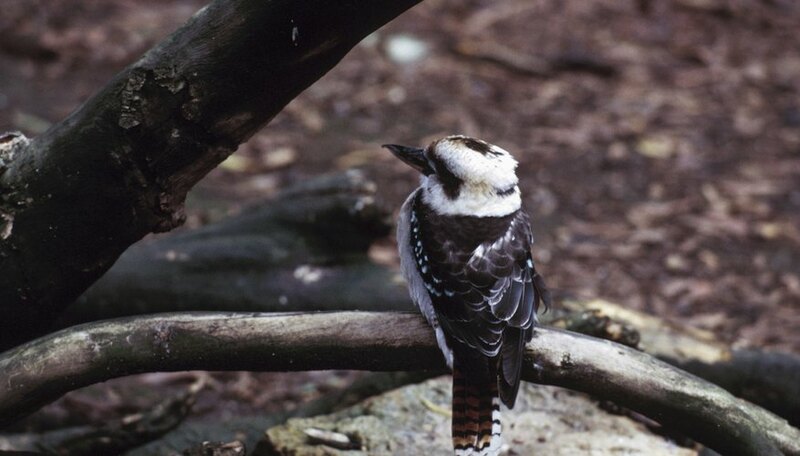 The Kookaburra is a bird native to Australia. Residents of this country are familiar with the bird's distinctive call, and value the Kookaburra's penchant for eating snakes and lizards. Someone planning an Australia-themed event or just looking for a unique costume would enjoy making a basic Kookaburra mask. This would also be a fun classroom project to teach kids about Australia and the animal world. Draw an outline of a Kookaburra's face on a piece of white paper using a black marker. Cut out the drawing, and glue it to a piece of cardboard. Cut the cardboard around the edge of the mask once the glue is dry. Cut out the Kookaburra's eyes with a pair of scissors so that the person wearing the mask will be able to see. Punch a hole in the mask near the right and left edges of the drawing. Insert one end of the elastic into one of the holes, coming up through the cardboard, and tie a knot. Wrap the elastic around the back of the head of the person who will be using the mask, and insert the other end of the elastic through the other hole in the mask. Tie a knot in that end of the elastic and trim off any excess. The mask should now easily slip on and off the wearer's head. Using crayons and glued-on feathers, decorate the Kookaburra mask. The mask can be colorful and fanciful, or it can be more realistically decorated. Refer to the National Geographic Animals website for a photograph of the Kookaburra that can help guide you. Wearing the Kookaburra mask may cause users to have limited visibility. Robin Pratt began writing professionally in 1993, when she moved to Russia to write for the "Moscow Guardian." Her work has appeared in the "Palm Beach Post," "Miami Magazine" and "Moscow in Miami." Pratt holds a Bachelor of Arts in Russian and religion from the University of Florida and a Master of Public Health from the University of Georgia..